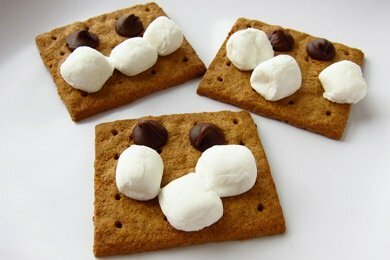 The combination of melted chocolate, graham crackers, and a soft marshmallow is SO dreamy. Unfortunately, you are usually talking about 2 massive crackers, a slab of chocolate, and a monster marshmallow which is GREAT if you are 10 years old, but not so great if you are 41. How do you get the portion size under control so you can still enjoy this treat? Try a Snack Girl created "Mini S'More". I baked these puppies in my oven and I had a blast making them. It was almost like I took the time to actually bake cookies! They are warm and satisfying and you don't even notice that they are "mini". Obviously, these aren't a super healthy snack. They are more like a whole grain cookie if you find a 100% whole wheat graham cracker. The brand I found is MI-DEL Honey Grahams. These MI-DEL graham crackers (see below) are different than the usual ones you find in the cracker aisle. You won't be able to slip these into your kids' lunchboxes instead of Nabisco's brand without them noticing, but they have a great grown-up, non-sugary, whole grain, satisfying taste and texture. BUT, once you add the chocolate and the marshmallow, you don't notice that they are less sugary and the contrast of the flavors is lovely. This is a great after school snack, or a fun dessert. I tried making these in the microwave but the cracker lost its crunch. Also, I heated up the crackers a bit before I added the other ingredients so the chocolate would get a head start on melting. The marshmallows melt more quickly than the chips, so if you skip this step you end up with soft marshmallows and hard chocolate. The nutritional information below the S'More recipe reflects using a 100% whole wheat graham cracker. Give this a try and let me know how it goes. Do you have any uses for mini-marshmallows? Heat oven to 350 F. Place cracker on baking sheet and heat for 3 minutes. Add chocolate chips and marshmallows and heat until melted (about 3 minutes). Enjoy! I like how you made them look like a smiley face...possibly by accident:) That might would get the kids to eat them. Ha! Good idea for nights that are too cold to do them outside,too. I love these. I have been baking oven baked smores for years. I sprinkle cinnamon or even ginger on them for flavor. Mmm...I must try this! I read awhile ago, and have confirmed, that most brands of marshmallows have blue dye in them,to make them more white! I found an online place that makes them, but do you know of a brand I can buy at Whole Foods that skips these additives and preservatives? I haven't looked for them in quite a while, but I remember seeing Tiny Trapeze marshmallows (in vanilla and chocolate, and vegan versions, too) at Whole Foods here in Manhattan, so maybe your local WF carries them as well. Lisa my friend who is on weight watchers told me about a similar snack she makes for 1 point as a nice dessert treat. I will try this when I get some chocolate chips. I also want to try a recipe I found on www.thekitchn.com for home made graham crackers. I will gladly share if you wish:) I also want to try a great recipe I found for homemade wheat thins. Its ridiculously simple: wheat flour, white flour, olive oil and a tiny bit of salt. that's it! I love that you get my favorite cracker but with no HFCS! What a good idea. Sometimes you just need something sweet and this won't make you feel guilty. I do this all the time. It's quick, easy and always fills that sweet craving. I also like to use just a bit of Marshmallow Fluff smoothed over the crackers. Yum. I love this recipe . I quit buying graham crackers a long time ago because of the ( fake food ) ingredients . I hope I can find the the Mi-Del brand, thank you !